If your perfect domain name is already taken and you cannot buy it, consider changing your company name or “flock” to a different domain extension. Recent months have brought lots of changes to the Internet and new trends have emerged in the startup environment. Currently, there are more naming options available than ever before and some, more than others, are gaining popularity among entrepreneurs. “Newcomers” such as .CO, .ME, .IO, .FM,.CLUB, .XYZ, or geoTLDs like .BERLIN and .LONDON seem to be more attractive startup options than the traditional .COM, .NET or .ORG. A memorable and easily brandable domain name is frequently a key to success. Domain extensions like .CO and .ME are especially popular and easy to remember. .CO is a country code TLD for Colombia but it is used as a shorter alternative to .COM. The .ME extension is the national domain of Montenegro and works perfectly in domain hacks, such as buy.me or love.me. For the dev community, there is the .IO extension– the country code domain for the British Indian Ocean Territory, which is interpreted as Input/Output. This is the new hub for startups building API’s or developer tools. On the other hand, FM radio stations along with audio streaming and some social media websites favour the .FM domain which is the country code TLD for the Federated States of Micronesia. 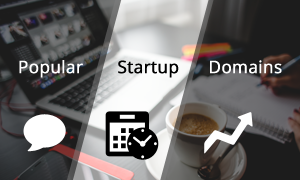 If the above domains do not fit your startup needs, there is also .XYZ which has branded itself as a generic extension that is available to anyone worldwide, or .CLUB which could satisfy anyone running a social organisation or a subscription club. To fully exhaust the naming options, there are also city-specific domains, such as .NYC. With the geoTLD you can show your affiliation with the specific location and attract local traffic to your site. In short, there is no need to panic if your desired .COM is out of your reach. There are many more unique domain names to choose from among generic and country code domains, depending on the nature of your startup and the industry that you are in. The possibilities are practically endless. If you wish to check if your startup domain name is available, please click your selected extension and enter the domain name in the search tool box. If you need assistance, please email us at support@web-solutions.eu or call on +44 (0) 208 133 3994.